Don't be misled by the title of the post, this is NOT an advertorial. I actually scheduled a post today but i thought i should blog about this incident instead. If you follow me on Twitter, you would have read my tweets at 5am in the morning. Story goes like this : I went to Standard Chartered to deposit some cash at midnight, slotted my card in the cash deposit machine, it successfully read my card, and then i deposited my money successfully as well. After which, the screen prompted if i wanted another transaction, so i went on to hit the "no" icon and the machine decided to HANG ON ME. I am perfectly fine with it hanging on me, but at least return me my card, right? But no, i waited for about five minutes, hoping it would return my card but the machine literally froze at the screen that asked if i wanted another transaction. First call : "I'm sorry this selection is not available for now, please call back later." Second call : They kept playing some music and telling me i could activate my card online repeatedly and no customer service officer was connected. I waited for about 7 minutes before putting down and attempting to call again. Third call : A customer service officer finally attended to me within a few seconds. And so the first thing i asked him was what could be done since their cash deposit machine hanged on me and my card was stuck in it. His reply : You have to come back when the bank opens at 10am. I am sorry nothing can be done right now. Anything else i can help you? I was hopping mad by then. So it is basically their fault that their machine hanged on me, and at my inconvenience i have to come back later on to collect my card. Excellent service i say. And if you think this couldn't get any better, wait till you hear the second part. I later asked him why it took so damn long for me to get connected to a customer service officer, and his reply was that he picked up my call within seconds. Yes, indeed he picked up my phone call in seconds, but before that i was told the service was unavailable and the second time i waited for 7 minutes and no one attended to me. His reply : "I'm sorry, we were experiencing high call volume." Yes, at 5am, they were experiencing "high call volume". I buy his story so much i am totally sold. The only reason to why anyone one would call in at that ungodly hour was either due to a lost card or for a case like mine. How many lost cards can they get in a night that they do not have enough customer service officers to attend to calls? Even a seven year old kid will tell you it is downright ridiculous. When i requested for a call back with an explanation why the whole incident happened, the customer service officer then told me that it was probably due to a system update they were doing. If they knew they were going to do a system update, wouldn't it make sense to temporarily sustain people from using the machine? Prevention is obviously better than cure. And quoting their bio from their Twitter page, it says "We're a global bank leading the way in Asia, Africa and the Middle East." Yea, i am pretty sure half of that does not make any sense after all that nonsense and inconvenience they have caused me. 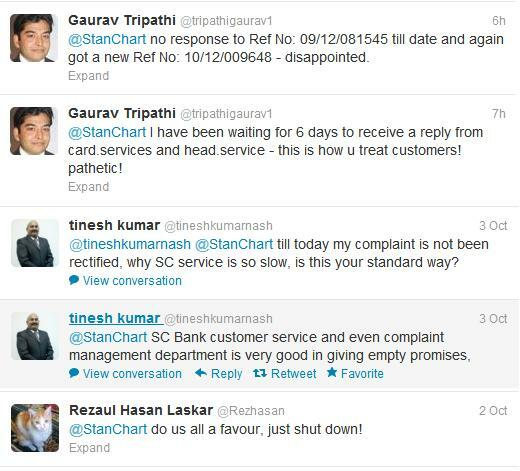 A search on Twitter seemed like i wasn't the only one that thinks Standard Chartered has got poor customer service. To make things worse, the people on Twitter seem like they come from all over the world. If I'm in Singapore and i have a problem, it could be my problem. But when people from all over the world has problems, I'm pretty sure the problem does not lie with us customers anymore. The last tweet has got the be the best - "do us all a favour, just shut down!" 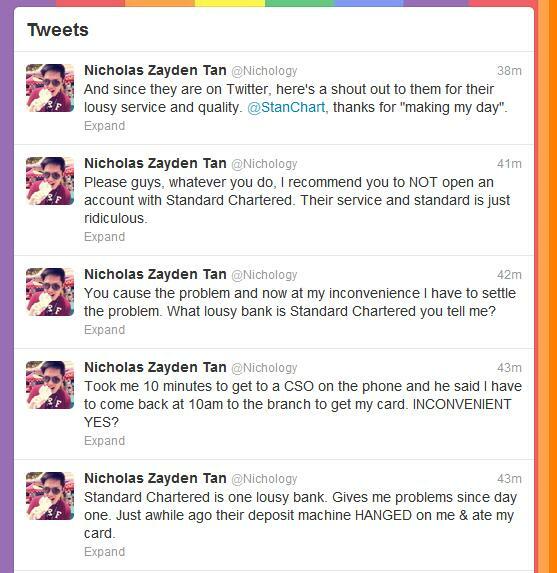 Let me recall what happened the previous time another bank's machine accidentally hanged on me. THEY COURIERED ME A NEW CARD THE NEXT MORNING. 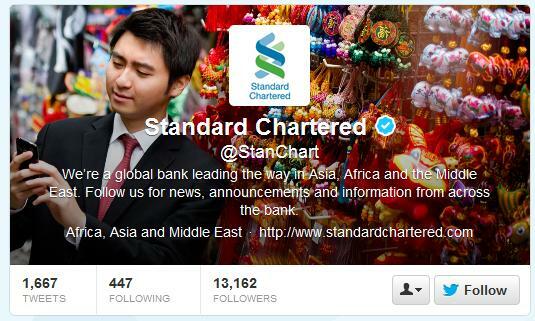 Oh wow, if Standard Chartered is "leading the way", I'm sure they are going awry. I'm just glad Standard Chartered isn't my "main bank". The only reason why i keep an account with them is because some places i patronize have discounts and such. I'm contemplating on closing my account when i go to retrieve my card. Times like these i am glad i have other accounts with banks that have never failed on me. It's always good to keep at least two bank accounts, just in case there's a long queue at the ATM, or for times like these. But for now, if you really intend to open another account, at least you know which bank to avoid. just stop whining lah its only a bloody atm card and it happened at 5am. just be very glad u dont have to be picking up calls at 5am from ridiculous customers like yourself. I do believe he's excercising his rights as a consumer, Jas. I do not see him whining or making an untruth. If the phone lines are 24 hours, it is the company's responsibility to be able to "pick up calls at 5am", no?